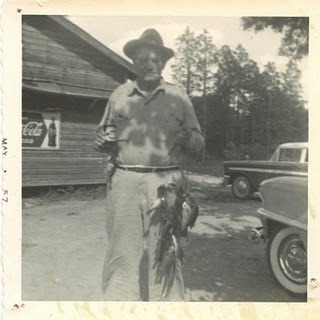 My Grandfather bought a one-room fishing shack deep down in the heart of Eastern Tennessee not long after coming home from the war. He'd disappear down there sometimes, sometimes in the winter and sometimes in the spring. He'd hole up, stay up pacing the floors all night long and deep into the morning. Smoke his Chesterfields, drink his whiskey all night long, never set a foot outside at all. He'd come back home to Lexington a week or so later, contrite as could be and ten pounds lighter, a fresh bloom of broken capillaries running red across his cheeks. When he died nobody touched the place. They boarded it up and they farmed it out and they burned all the maps. My father, my uncles, nobody wanted anything to do with it. Bad memories and worse dreams. Eventually the State of Tennessee reclaimed the place on back taxes, held the place in escrow. My wife and two sons bought it back from the state and they gave it back to me as a present. We drove down, I stepped inside, my knees were shaking. 10 cent Veteran's Day American flags and paper devil's masks, dog tags hanging from a string. Postcards from Texas and California, the alligator farm in St. Augustine. A jar full of pennies and a jar full of rocks. A rocking chair and an old floral-patterned sofa he must've used as a bed. I stand on the bare wood floor of the shack and I catalogue this stuff obsessively. Empty coke bottles all in a row and Ira Louvin's smiling face. Pocket knives and arrow heads. An unopened case of Dickel. Ball jars, tobacco tins, a butterfly in a small black frame. Election poster from 1954, John Cline County Sheriff. I step outside and look at my rented car, two boys sleeping in the back seat and engine still ticking over in the heat. I close my eyes and listened to the burble of the McMinn River down below. Down below and far away.